Capt. James Kirk To Command Navy's New 'Stealth Destroyer' : The Two-Way The U.S. Navy officer is listed as "prospective commanding officer" of the newly launched USS Zumwalt. Capt. James T. Kirk always got the latest, most advanced ship in Starfleet, so it seems only fitting that the Navy's new stealth destroyer, the USS Zumwalt, is slated to be commanded by none other than Capt. James A. Kirk, USN. We can only speculate about the ribbing the Bethesda, Md., native might have received from fellow officers as he rose through the ranks, but it doesn't seem to have hurt his career any. The 23-year veteran of the surface fleet, who is listed as "prospective commanding officer" of the Zumwalt, never commanded the recently retired USS Enterprise (CVN-65), but he did serve as operations officer aboard another aircraft carrier, the USS Ronald Reagan (CVN-76). Kirk was also commanding officer of the frigate USS De Wert (FFG-45) and served in various capacities aboard several other ships. In any case, the USS Zumwalt (DDG-1000), which floated out of drydock on Monday, is a choice assignment. "The largest destroyer ever built for the Navy, the Zumwalt looks like no other U.S. warship, with an angular profile and clean carbon fiber superstructure that hides antennas and radar masts. 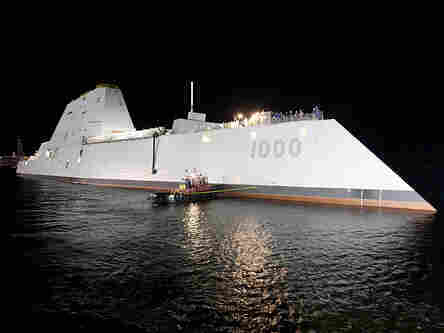 "Originally envisioned as a 'stealth destroyer,' the Zumwalt has a low-slung appearance and angles that deflect radar. Its wave-piercing hull aims for a smoother ride. "The 610-foot ship is a behemoth that's longer and bigger than the current class of destroyers. It was originally designed for shore bombardment and features a 155mm 'Advanced Gun System' that fires rocket-propelled warheads that have a range of nearly 100 miles. "Thanks to computers and automation, it will have only about half the complement of sailors as the current generation of destroyers."